Prairie Fest: Now accepting exhibitor applications! Prairie Fest is an annual celebration of nature combining interactive programs, an electric vehicle show, children's activities, tours, and entertainment. During the Fest we will have yoga/meditation in the morning at 9am with presentations and other activities from 10:00 am through 3:00 pm. We are looking for artists, makers, and exhibitors to participate in this year's Prairie Fest. While the overall theme of Prairie Fest is nature and wildlife, we welcome all vendors to apply. At one time, most of Fond du Lac County was covered by prairie -- native grasslands that were home to bison, prairie chickens, bobolinks and other wildlife. At the Gottfried Prairie and Arboretum on the UW-Fond du Lac campus, a group of volunteers has reestablished the native plants that once grew on this site. 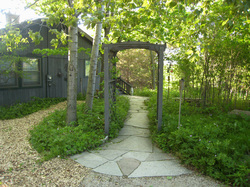 The project began in 1991, with the goal of representing the original plant communities of Wisconsin in a small arboretum. At present, volunteers have planted 42 acres of native prairie grasses and wildflowers, developed two wildlife ponds and planted 176 native trees and shrubs. Most of the wildflower seeds were collected from some of the last remaining original prairie sites in Fond du Lac County. To educate local residents there's an interpretive trail as well as six benches, two picnic tables, and a kiosk for recreation. The Formal Arboretum is an innovative attempt to depict the native plants and plant communities of Wisconsin in a design representing the "Tension Zone" of our state. This is the area of overlap of northern and southern Wisconsin plant communities, which occurs in the Fond du Lac area. It consists of savannah, lowland forests and northern mixed forests, plus their associated wildflowers. The Gottfried Prairie and Arboretum is named for Bradley Gottfried, former dean of UW-Fond du Lac, and a major force behind the project's initiation and development. Dean Gottfried's vision and persistence have resulted in the restoration of a portion of native prairie for county residents to enjoy. Monday, April 22nd 2019 at 6:00 p.m.
Bill and Connie have been living at their home on Birchwood Lake for over 25 years. While disturbing the land to build their house, they have worked over the years to restore their land to a series of natural communities, including an oak-hickory woods, restored prairie and a wetland with natural springs. They have removed invasive shrubs from their woodlot and turned a former cornfield into a native prairie and prairie nursery. Connie collects seeds from the nursery to grow in a greenhouse to establish new gardens and enhance existing ones. She has obtained special permits to grow several state threatened species which now thrive here. Over the years they have cataloged nearly 600 species of plants and animals on less than 10 acres. This program focuses on their experiences in natural landscaping and land management and provides a range of examples for using native plants for both small gardens and managing larger areas of land. Bill worked as the naturalist and wildlife educator for Wisconsin Department of Natural Resources at Horicon Marsh for 27 years, where he conducted more than 3,700 education programs for over 220,000 people. His broad audiences included 66 delegations of scientists from 43 countries who came for professional training. In his personal time he has traveled widely in search of the world's birds and the wild places they inhabit. His travels have taken him throughout Central and South America, across the Canadian Arctic, to Africa, India, Southeast Asia, Borneo, Australia, New Zealand, Russia and Mongolia. Connie runs Kettle Moraine Natural Landscaping, a business that specializes in local ecotype forbs and grasses for prairies and savannas. She has helped numerous schools, businesses, and individuals to establish native prairies throughout Wisconsin. In addition to coordinating the planting of the Gottfried Prairie and Arboretum, she has also served as the organization's Grounds Director and Education Coordinator throughout the years.